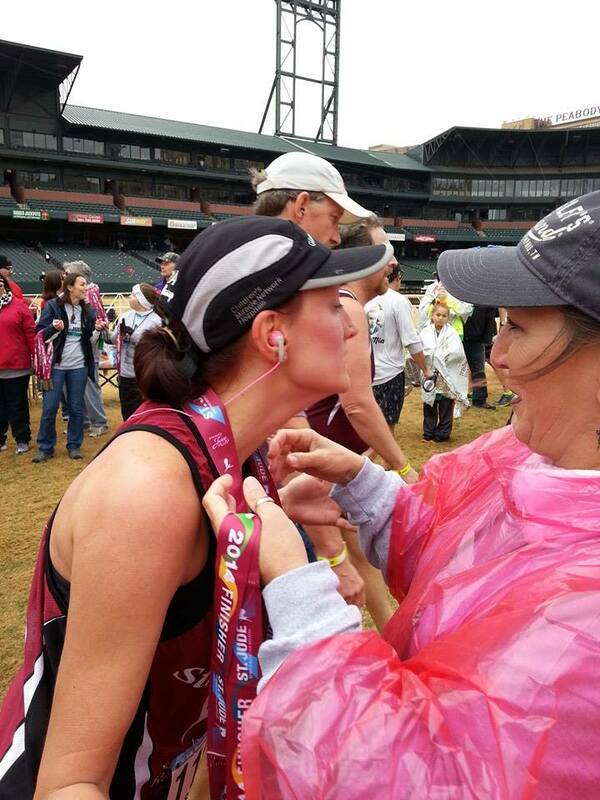 Today was a very special day as our daughter-in-law completed the St. Jude Half Marathon with a personal best of 1:56! Samantha is our first family member to beat David’s Personal best for a half marathon at 1:59! Samantha was a St. Jude Hero today- raising money and running for the children who are struggling today to just stay alive! We are so proud of you Samantha and so proud to have you as our daughter-in-law! Way to Go! 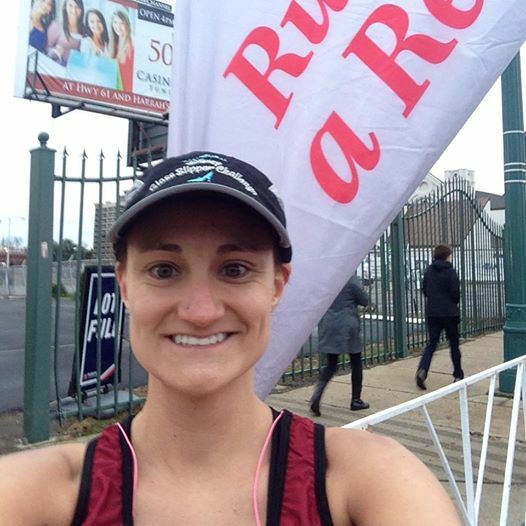 Samantha Salmonson’s PB of 1:56 in the St. Jude Memphis Marathon! A Marathon for a cause! St. Jude’s in Memphis enables miracles to happen. But the only way that they can do this is through their supporters and fundraisers. They provide hope for so many children when there seems to be no hope! We had the opportunity to tour St. Judes Hospital and immediately decided we had to run this half marathon! 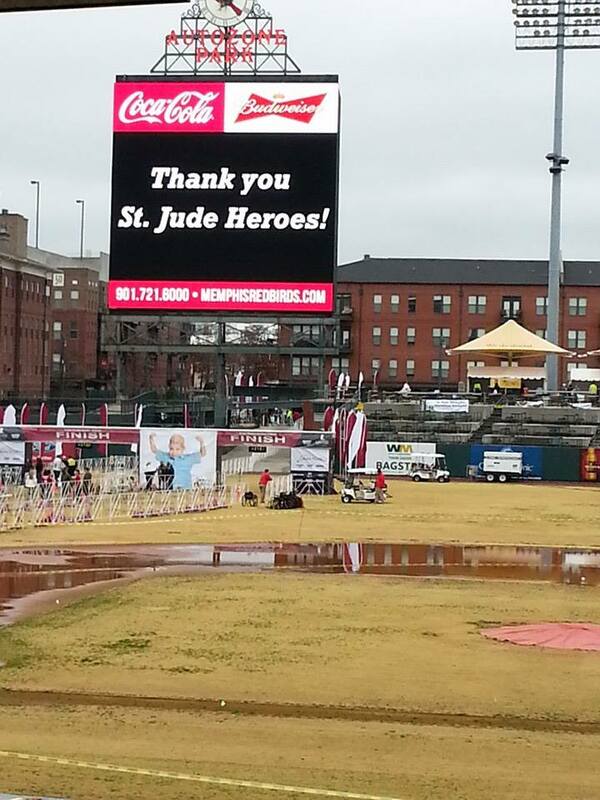 We would run this for the children! As you can see from our picture we chose to dress up as Elvis. 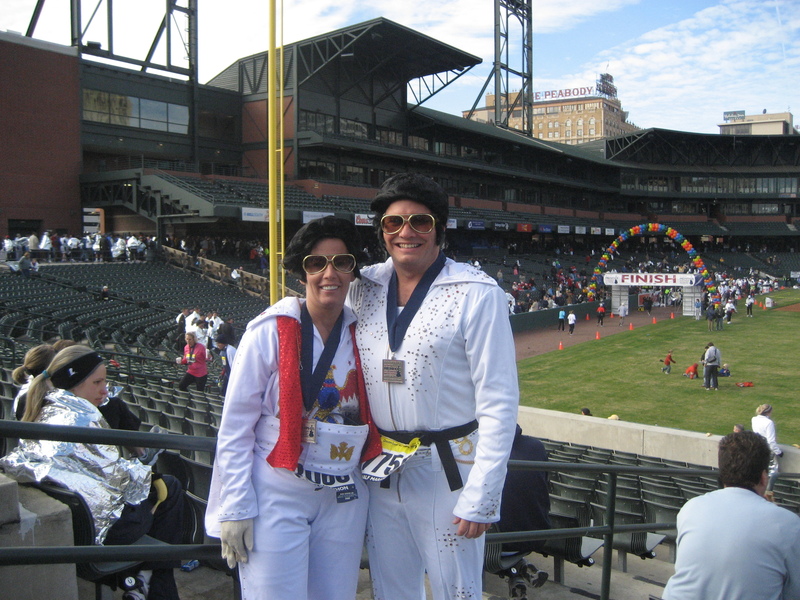 Yes, we ran in these costumes the entire 13.1 miles! They were a bit uncomfortable but they really drew in the crowds!!! You would not believe the looks we got and the amount of runners wanting to take their picture with us. You know, I can’t blame them as we looked just like Elvis!!! It was a cold morning that day, started out about 48 but the good thing was that we had a lot of clothes on so the weather did not bother us too much! 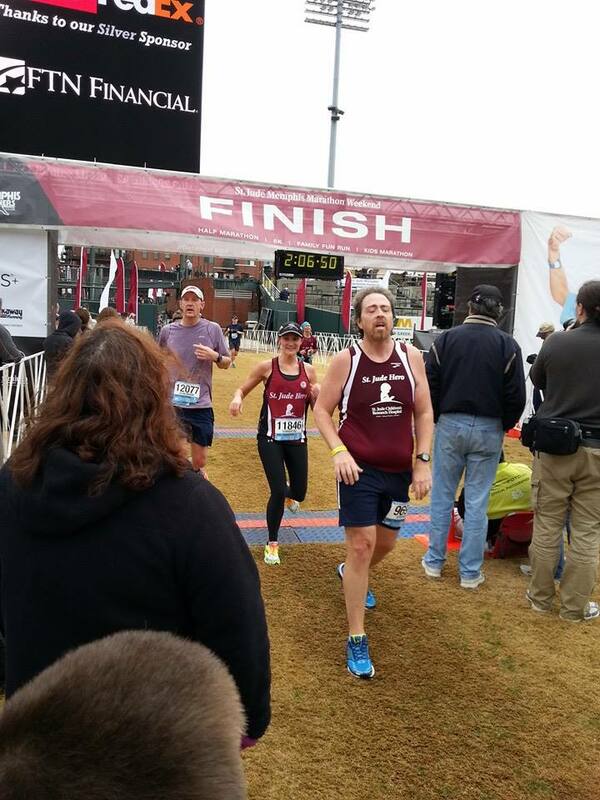 We ran the course together for this one and had many supporters along the way high fiving, etc! The course was a nice flat course and was very entertaining along the way with all of the bands, etc. We did not wear our headsets during this race but rather enjoyed the music together! At the end of the race after we crossed the finish line the photographers grabbed us and pulled us aside. They said “it is about time you all got here”. We looked at each other with confusion and then asked them what they meant by that. 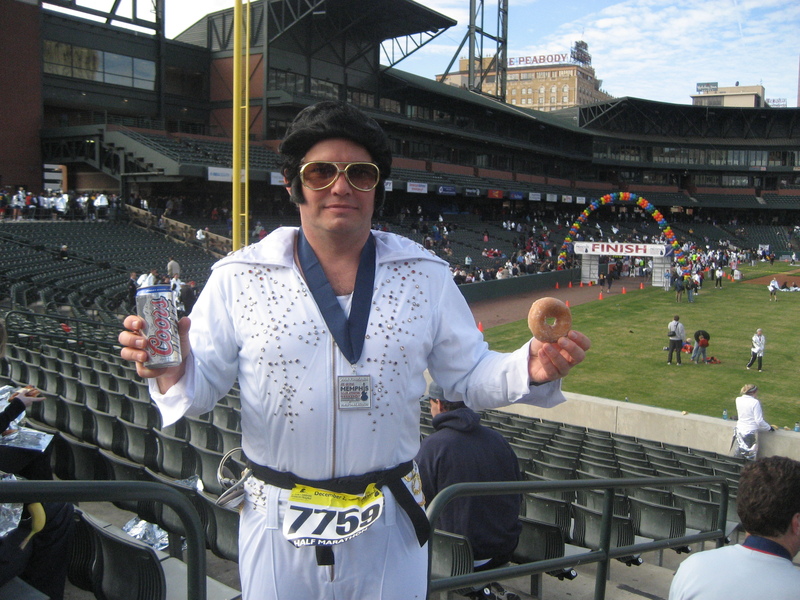 They thought that we were the Elvis that the race had hired to take pictures with the runners. We laughed our butts off at this one and told them we would love to do this but we needed to go get replenished from the run! It was only a matter of minutes before the real Elvis showed up! Taking pictures with the runners along the course! Krispy Kreme donuts and chocolate milk at the end!!!! !